As a special THANK YOU for taking on toxic chemicals in cleaning products, when you take the Ditch the Dryer Sheets Pledge anytime between March 26, 2019 - April 30, 2019 we will email you a special code to receive a discount off your next purchase from Molly's Suds! Mmm, the fresh scent of laundry that’s been dried with dryer sheets. Wait a minute – how do dryer sheets DO that? Unfortunately, dryer sheets can contain some harmful chemicals – including hidden fragrance chemicals that lots of people are sensitive to – that vent off into the air we breathe and rub off on our clothes and then onto our skin. Yikes! And the kicker is that dryer sheets aren’t even necessary to our laundry – so they’re just an extra source of exposure to toxic chemicals. It’s time to take the Pledge to Ditch the Dryer Sheets! Click here! Women have tons of consumer power when it comes to demanding safe products. We make almost 85% of consumer decisions in the average home. This means that companies pay a LOT of attention to what we buy – and what we don’t buy. When we band together to stop buying a toxic product, we can have a huge impact on making the marketplace that much safer. What are dryer sheets made of, anyway? Dryer sheets are relatively simple products, generally made of a polyester sheet that’s been covered in a fabric softener chemical and – usually – fragrance chemicals. The amount of fragrance used in dryer sheets can be significant, representing up to 10% of the contents of the product! These chemicals rub off the dryer sheet and coat your clothing in a slimy layer that has the effect of making your clothes feel softer. Whoa, whoa, whoa – are these chemicals toxic?! Fragrance chemicals: Fragrances can include tens to hundreds of different chemicals, some of which are toxic, and many of which are known allergens, like limonene and linalool. ALL fragrance chemicals are usually kept secret from consumers. Volatile organic compounds like acetaldehyde, and butane, which can cause respiratory irritation. Quats: The fabric softener chemical is often part of a family of chemicals called quaternary ammonium compounds, many of which are linked to asthma. Acetone: can cause nervous system effects like headaches or dizziness. Not surprisingly, when asked, survey respondents frequently report adverse health effects from exposure to dryer vents. One study found nearly 11% of the respondents reported irritation from exposure to emissions from dryer vents vented outside. Nearly 40% of respondents who indicated that they were “chemically sensitive” reported irritation from dryer vent emissions. So dryer sheets are unsustainable and unnecessary, too? Dryer sheets are single-use – which means that we’re throwing them away after each round of laundry! Chemicals from dryer sheets can build up and clog your dryer’s lint screen, making your dryer a lot less efficient. In addition, dryer sheets are totally unnecessary for actually making our clothes cleaner – we don’t really need them, and so they’re an easily-preventable source of exposure to toxic chemicals! 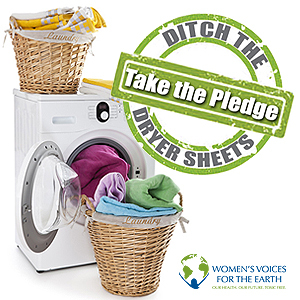 Take the Pledge to Ditch the Dryer Sheets! You’ll reduce your exposure to unnecessary toxic chemicals – and you’ll also be reducing others’ exposure by ensuring that these chemicals aren’t being emitted from your dryer vents! Throw an old sweater in with your laundry to decrease drying time and reduce static. You can even ditch the dryer entirely and use a clothes rack or clothesline. I’m allergic to wool. Do you have any other suggestions for an alternative to dryer sheets? I noticed you mention and old sweater but I assume you mean wool for that one too. Many people are also allergic to the natural fabric softeners, and often natural products still include fragrance, unfortunately. Thank you for this post – happy to take the pledge! threw the box of dryer sheets out. wish i had known about this a log time ago.thank you for the information. Just bought the Woolzie balls! Can’t wait to try them out. It’s a double bonus–I save energy (and $$) and reduce my exposure to toxic chemicals! Hey Lara! The wool balls are awesome – hope they work for you too. Thanks for spreading the word about our pledge! I haven’t used dryer sheets or fabric softener in a long time. Vinegar in the wash helps some with static and its s great natural disinfectant. We are 100% scent and chemical free due to environmental illness but the truth is everyone should be getting rid of all the scents. Toxic and killing our planet!!! I make my own laundry soap (pretty easy, castile soap bar in the food processor, add equal amounts of borax and washing soda), white vinegar in the rinse dispenser, balls of aluminum foil in the dryer along with the rubber bouncy balls, and a microfiber cloth or washcloth with a few drops of lavender on it if I want smell in the dryer. Pretty simple, no toxic chemicals. I use borax in my wash with detergent and don’t need dryer sheets. Occasionally use 7th Generation softener in the rinse but NO dryer sheets. Been ready to ditch the dryer sheets ever since found out the truth. I have never heard of wool dryer balls either! But we were just having a discussion about dryer sheets because I stopped using them long ago…and we just live with the static. Turns out, it bothers some members of the family more than others. I will give the wool balls a try now, thanks for the tip Alex! Now that it is getting warm again, a lot of our clothes get dried on the clothesline. And those don’t get any static at all – just a little crisp! We haven’t been using dyer sheets or fabric softener ,we use those plastic dryer balls, the sames ones for ten years now. we put vinegar in the fabric softener to rinse the residue of detergent. Thank you for the excellent post. I have not used laundry detergent, fabric softener, or dryer sheets since I learned about their toxicity several years ago (Instead, I use soap nuts in my washing machine). I am very concerned about the health and environmental impacts of these toxic laundry products. It is terribly unfortunate that one cannot even enjoy a walk through one’s neighbourhood without being exposed to a toxic cocktail of heavily scented air. I am often forced to close my windows during the summer due to the toxic dryer sheet scents which waft in. This is a huge health and environmental issue that far too few people know anything about! Thank you, Alexandra Scranton, for helping to spread the word. You have inspired me to spread the word in my own community! You might check out wool dryer balls made with US wool and made in the US…there are quite a few! I haven’t used them for years and have a mission to have many others do the same. Since Norwex, the company I am an Independent Sales consultant with, sells dryer balls and their mission is to improve our quality of life by reducing the amount of harmful chemicals in our home, I get to share with 5-40 people/week how harmful/unnecessary dryer sheets are! The word is getting out! I just create a baseball sized ball of aluminum foil and put that in the dryer. Lasts for a year. And you can just wash used pieces to create the ball. I see the comments re: aluminum foil to reduce static, but the dryer balls really reduce the wrinkles and the towels and cloth diapers come out so soft!! Try the wool balls with the aluminum. The aluminum breaks off after just a few cycles so watch the pieces getting stuck in your lint trap. I LOVE LOVE LOVE my Norwex. 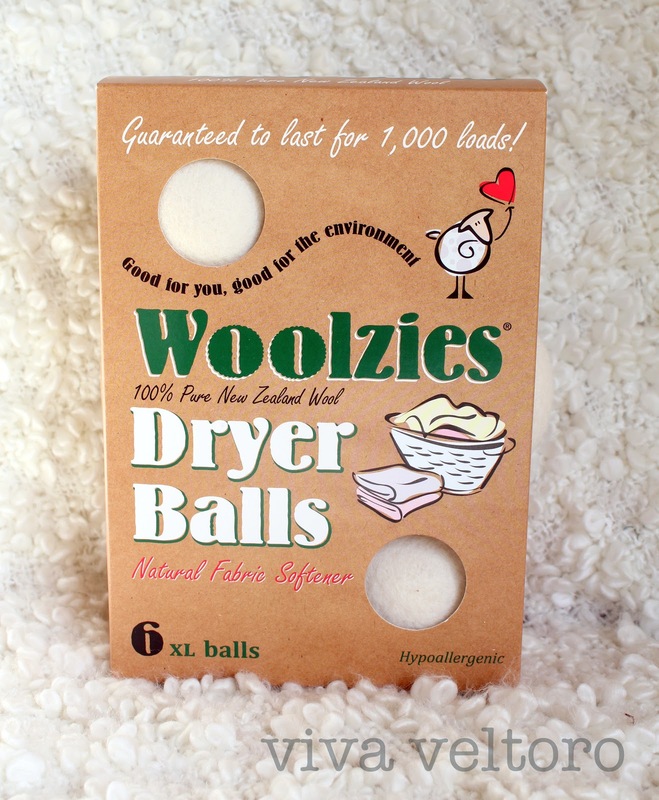 I use the dryer balls and the wool dryerbals (depending if I want to add essential oils)! Norwex dryer balls are a great alternative to dryer sheets. I have “baked on scuff mark” type spots on the walls of my dryer. I am very careful as to things I dry (no chewing gum in pockets etc.) These marks seem to be increasing in number, could it be the type dryer sheets I use . I will start using balled up foil as of today, just in case. Thanks for the Ditch the Dryer Sheets campaign! I just suggested to WeAreUltraViolet.org that they recognize assault-by-chemical exposure as a form of violence – and for them to encourage supporters to behave in ways that meaningfully reduce this violence. The starting point I suggested was to stop using dryer sheets…and to begin encouraging fragrance free meetings. So many other ‘health’ organizations (that tend to focus on funding ‘awareness’ and research limited to diagnoses and treatments) need to become strong advocates of prevention. HELP! I am 65 yrs old and have asthma, copd, and an unknown cause of neurological illness. I recently moved to a wonderful house in a nice neighborhood and I love it…with one exception. My neighbor uses heavily scented dryer sheets and the exhaust vent of her dryer is less than 30 feet from my house. I cannot sit on my porch or go outside when she is doing laundry. I also can smell it when I am in my kitchen or living room, with doors and windows closed. I’ve had to use more asthma medication and breathing treatments because of this. Neighbors on the other side of me have also noticed the”fragrance” in the air and wondered where it came from. Now that we know, we are trying to find a nice way to approach this issue. Any advice? Hopefully a rational conversation is all you will need to help change your neighbor’s behavior. If they are still determined to use their dryer sheets perhaps you can make an arrangement to have them not do their drying when you most like to be on your porch? Good luck – and let us know what happens! Can you please give me the ingredients for Walmart’s Great Value free and delicate sheets. I need this information for a friend of mine. She said it also said it “contains fabric softening agents(cationic types) in a non woven sheet. And the otherone is Bounce free and gentle sheets. Any information and ingredients on both of these would be greatly appreciated. Thank your for the information. As someone who suffers from Multiple Chemical Sensitivity there are times when I am completely home bound. One of the most discouraging things I experience is looking out my window on a beautiful sunny day, and thinking to myself that maybe I could walk outside and enjoy the weather, only to be made sick as soon as I open my back door from the chemicals blowing out my neighbors dryer vents. People just don’t realize how harmful these products are. The more they are made aware that these chemicals are toxic for everyone and not only people like me the more things will begin to change. Molly’s suds website says that their dryer balls do NOT reduce static! I sure wish these articles and facts were printable so I could share hard copies with my neighbors. I’m usually locked in my house because of the dryer vents in the neighborhood. Have your neighbors responded to your requests? I have the same problem. I’m a chemical refugee from my own home because of neighborhood laundry exhaust. @Alex – please consider extending this pledge to include fabric softener and detergent with fragrance. Would you be willing to collaborate with the National Human Ecology Action League (HEAL) on developing and sharing a toolkit (printable and shareable) that will help people reach out to their neighbors? I’m using borax and washing soda and vinegar in the rinse cycle. Impossible to walk in our neighborhood without becoming ill from toxic dryer sheets. 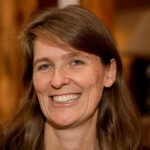 I posted the Anne Steinnemann link above in our NextDoor (which includes 15 adjacent neighborhoods.). As a result, I got blasted by angry neighbors telling me to move out if I didn’t like it, and that I had no business trying to control which products people use in their laundry. I think they are angry because they don’t like feeling duped. I mean, who would? People are unaware that the general terms “biodegradable catatonic ingredients” can mean any combination of hazardous waste materials. Sad. Every neighborhood affected and seems hopeless at times. We own lovely homes and can’t enjoy our neighborhoods. Vinager in the Rince cycle cuts static and kills oders. Works in the softener dispenser in newer washers or you can put it in a Downey fabric softener ball. Elizabeth, there are toxic ingredients in Downey. I am always looking for ways to decrease my toxic load and my impact to the environment. I have gotten to the point of cutting my dryer sheets into thirds so I am using much less. However, after reading this post, I am going to go sheet free! I am concerned though, with the main alternative being offered up of Wool Dryer Balls–unfortunately, these animals used to produce this wool are generally treated very poorly, The simple act of shearing causes trauma, bleeding, sores and overall abuse of these animals. Is is very unfortunate we have not come up with a way to harvest wool humanely. I will try some of the other animal free suggestions. I LOVE using wool dryer balls. To eliminate static, put Himalayan salt in a cloth bag. Leave with wool balls in dryer. My wife has had six anaphylactic attacks due to their scents and each episode requires three Epi pen injections before getting to the ER. The neighbours have seen it and don’t care. Even when being transported to the ambulance, she is exposed to more of this toxic air as they would not turn off their dryer! We will continue to research and pursue this matter legally, but we just may have to move. As we retired we wanted to down size but now may have to look for a bigger property to isolate ourselves from neighbour fragrances! I haven’t used any dryer sheets for the last couple months, however, with the dryer winter air, I’m snapping and crackling all over, and my poor cat hates getting her ears zapped. I cannot use the wool balls and the old wool sweater idea is definitely out as I’m allergic to wool. There are no softeners I can use in the washer either. This is what I found on google. It says to use one sheet one time, I use 1/2 sheet, twice. 80 sheets in a box gives me 320 loads. I found the biggest problem for me with traditional dryer sheets, I scented and dye-free, was the polyester. When it got hot in the dryer it gave off a funky odor. I cannot tolerate any petroleum based product, I always thought it was just my over sensitive body that had the smell being obnoxious; that’s why I switched to the seventh generation sheets. I’m curious, is it the chemical itself, or the polyester, or both in combination with heat that is the real issue. I use some white sage in an old white sock and add more as needed to add a nice gentle scent. You can add rosemary and/or lavender which skeeters don’t like either. I purchased white dryer balls to aide in softening. I use a set in the whites only and another set in the colored only. It helps. I use dampened hand towels to help get wrinkles out along with my herbal sock to freshen as needed. I’m not understanding how throwing an old sweater into the dryer will reduce static? On the contrary, everyone including the dogs get incredible static shocks without softener in the dry winter climate. You’ll have to come up with better options or we won’t be able to come into contact with each other. Dryer balls come in wool and several other plastic materials. Vinegar in the rinse also helps. If you wear only synthetics, and dry them on med-hot you may still get static as these synthetics are petroleum products and toxic within themselves. So don’t dry them on high, nor dry them all the way. Toss them briefly then hang to dry on hangers. Have never had a static issue following these simplicities. Wool Dryer balls are cheaper online and use 6-10. I currently have 9. Going on 4 years and they are still effective.